"I wanted to know if you know of paints or markers or other mediums I can use on my gear that wouldn't be harmful to the coral or marine life. I want to put elaborate, colourful stuff on my fins to begin with but I don't want to do it at the expense of underwater life. If you know of anything I could use please let me know." Lead-based paints. These are getting harder to find, but just like its toxic to humans, lead paint in the water can be harmful to sea critters. Anti-fouling paints. Again, you aren't likely to find these at a local crafts store, but anti-fouling paints are used for painting the hulls of ships. They are designed to kill barnacles, algae, and other marine organisms that would slowly eat away at boat bottoms, so they are of course not good for anything living in the water. I doubt you would run across these, but I don't want readers to see them, see that they are intended for boats and think they are a good choice for equipment decoration. Acrylic paint is actually a good option, with one caveat: it must stay on the material you paint! I personally found out that acrylic paint (at least the "beading" squirt bottle kind) does not hold well to fins, and will easily get knocked off. Because acrylic paint is just a form of plastic, this can't be great for whatever it lands on. However, it will stick well to BCD's and possibly wetsuits as long as you spread it flat, and it's not any worse for the environment that any other plastic on your BCD, regulator, mask. etc. If you are unsure, test it out by painting the equipment, let it dry, and knock it around a bit to simulate a dive. If some of it chips off, then you probably should peel off the rest and use something else. Tip: many scuba shops sell pricey paint specifically for dive gear. This is just acrylic paint, sometimes called "fabric paint", that you can find at any hobby / craft store for one-fourth the price. Permanent markers are awesome for drawing patterns and coloring. They are not water-soluble and will not leak toxins into the reef. Better yet, permanent markers can write on just about anything, even fins, which acrylic can't hold on to. I personally use them to write my name / initials on my gear. Update: another email from Marwah alerted me to this option. Paint markers are oil-based and will soak into a lot of materials that acrylic and permanent markers may not penetrate. In fact, if I were to decorate equipment from scratch, I would buy a small set of paint markers and supplement with a few permanent markers that I have on hand. I'm in the middle of a cross-country move and had to initiate a second round of DVD case reduction---they're just a huge waste of space. The inlined picture is a few of the cases I had to throw out. I put them in recycling, but who knows what their final fate will be? Interesting to note is that all these cases were acquired in the last 1-2 years, well within the era of broadband internet connections. We don't see much diving fiction, besides maybe a few scenes from Clive Cussler novels. 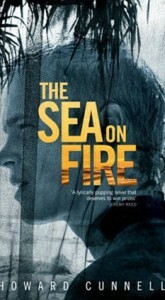 In The Sea on Fire, author Howard Cunnell wisely foregoes the diving-as-action approach and presents the emotion and sensation of diving that we feel through the main character, Kim. As a diver and someone who writes about diving, I was intrigued when I heard of this novel and how it would capture these feelings in words. No matter which scuba diving agency you train through, once you get to the leadership level there are some basic theory requirements you must complete (the Recreational Scuba Training Council requires it). With areas ranging from physiology to physics, it can feel like a lot of material. 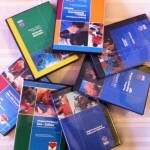 PADI Switching to Slim DVD Cases? I was in my local dive shop a few weeks ago and saw some of the new PADI merchandise. Among them was the DVD for a specialty course, I think it was Underwater Photography. Really like the sea? Then spend the rest of eternity there. Neptune Memorial Reef will take your cremated remains and mix them with concrete, then place the resulting molded shape into an artificial reef structure. A commemorative plaque is placed later. You're not quite fish food, but you get to hang out with your favorite creatures. It sure beats the cemetery! It had been a long day. After two dives near Los Coronados islands, off the coast of California, we were having boat trouble. 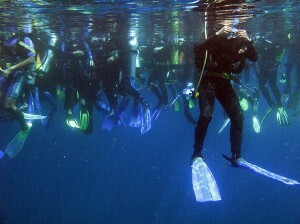 Meanwhile, the passengers were getting restless and ready to just call it quits, forgetting our third dive. Tec divers spend a long time decompressing at various depths. Usually much longer than the actual dive length. Most of that time is spent in fairly shallow depths, just hanging on the anchor line. I had an idea a while back to put an eBook reader like the kindle or nook into a ziplock bag and tie it to the line at 20 feet. Then, when you're spending 30+ minutes hanging out, pass the time with a nice book. A scuba excursion operator was bit on the arm during a recent "shark interaction" dive. Now I’m not going to say he deserved it. That’s unkind, and it’s not true. 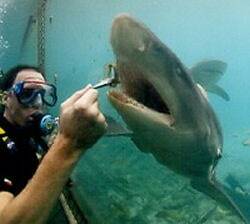 You all know how I feel about shark feeding. If not, click the link and read. I’ll wait. I recently read an article on AquaViews that posed the question, are scuba agencies sacrificing training quality for numbers? I don’t think anyone would deny that most scuba agencies are after numbers. Anyone who has gone through a pro-level certification can tell you that. Is it such a bad thing? Having numbers drives the accessibility up (and price down) for scuba diving, but what if the price is too high?